I’d like to dedicate this post to all the marketers out there who are confused or intimidated by their CRM systems. 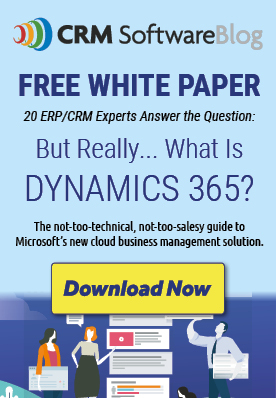 Like you, I once stared down the seemingly limitless options and customizations of Dynamics CRM (before the days of 365) and wondered how I was supposed to understand any of it. If you’re not natively technical, wading through data structure in your first Dynamics CRM/365 install can be more than a bit overwhelming. Add in to that the fact that most CRM systems are owned by the sales team, and it’s easy to understand why marketers might take a hands-off approach to their company’s CRM system. But fellow marketers, this is a dangerous approach. Here’s why: in an ideal world, Marketing deserves at least a 50% stake in every organization’s CRM system. It’s our source of truth—it’s where everything we need to create a custom experience for our prospects lives. We deserve a seat at the table, but to earn that seat, we’re going to have to learn how to talk CRM speak. What Good Is CRM for Marketing Anyway? Once you have goals, you’re going to have to think through how you’ll get the data you need to power them, and where you’re going to keep that data—perfect tasks for your CRM system, which is designed to organize and sort the sales data you need to be a data-driven marketer! How does the sales team interpret what those fields are for? Are there fields not in use that could be activated? What sales data is currently captured that you can use? What’s the sales definition of a lead? What steps guide the Lead to Opportunity qualification process? What happens to an Account after the sale closes? You know what’s there—now determine what else you need to power those campaigns we talked about. Think about how you want to segment your sending lists and work backwards from there as you decide what custom fields you want to request. Next, determine how you’ll capture that data—is it through an integration? Through a campaign that asks the customer to tell you? Remember you can’t ask your sales team to capture everything. If you ask for too many required fields, you could create CRM fatigue. It’s not enough to know if a sale closed—you need to know what type of sale and for what product or service! You can create upsell and cross-sell campaigns from that data, like a “You might also like” cross-sell campaign, or an add-on offer shipping confirmation email. Knowing what the customer bought can help you create more stickiness than simply knowing that they bought—and can help you ask for referrals down the road. Now that you know what you want, you can determine how you’re going to feed those fields. Integrations often required technical team hours, so you’re either paying your Microsoft Partner or using the time of an internal resource. Integrations aren’t cheap, and you’ll need a use case to sell them. Explain first where each data point needs to map in your CRM system, and determine if it’s possible to map them on a regular basis. Easy sells are your marketing automation platform, but consider integrating to accounting systems, inventory systems, ecommerce sites or anywhere else sales data might live. Because you’re going to have to move the Leads and Contacts that match your definitions into a marketing list, and a workflow is your best bet to automate the process! Workflows are a set of logical rules that define the steps necessary to automate a specific business process, task, or set of actions to be performed. You’re essentially saying, When Contract End Date = 3 months from now, then move to Contract Renewal Marketing List. You’ll use these workflows to create Marketing Lists, and the Marketing Lists will automatically feed your marketing automation platform—so choose wisely and be sure everything you need is set up on both sides of the equation. The little bucket is for the actual campaign, and it needs dates and costs attached. This will give you data on how successful are events on the whole and how successful was this specific event. Both the big bucket (Lead Source) and the little bucket (Source Campaign) must be required fields! With understanding of why you want the data you want, you’ll have more buy in from your sales team and greater success with your CRM system. Best of all, you’ll know how to make requests and have real conversations with your CRM stakeholders. Ready for the next steps? Check out our guide to the types of campaigns you can build in your marketing automation platform once you’ve integrated to your CRM system here, or read our post on integrating CRM and marketing automation here. Natalie Jackson is the marketing director for the emfluence Marketing Platform. Learn more about her here.